Compelling new data that chemical and fossil evidence of ancient microbial life on Mars was carried to Earth in a Martian meteorite is being elevated to a higher plane by the same NASA team which made the initial discovery 13 years ago. Sources tell Spaceflight Now that the new data are providing a powerful new case for the Allen Hills Meteorite to have carried strong evidence of Martian life to Earth -- evidence that is increasingly standing up to scrutiny as new analytical tools are used to examine the specimen. The latest findings are the product of new research using more advanced High Resolution Electron Microscopy than was in existence when the initial findings were made and announced by NASA and the White House in 1996. 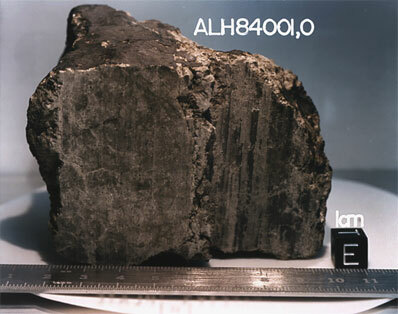 Those laboratory sensors are being focused directly on carbonate discs and associated tiny magnetite crystals present inside the meteorite Allen Hills ALH 84001. Sources tell Spaceflight Now that the more detailed data on magnetite crystals and carbonate discs now available largely counter a wide range of opposing theories as to why the finding should not be supported as biological in origin. 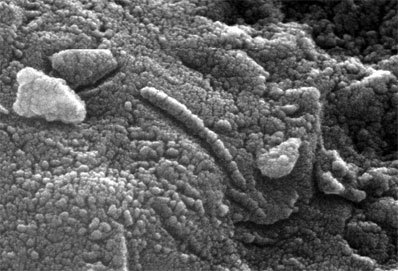 Now, 13 years after the Martian meteorite life story emerged, the science team finally feels vindicated. Their data shows the meteorite is no smoking gun but is full of evidence that supports the existence of life on the surface of Mars, or in subsurface water pools, early in the planet's history. The new data are expected to be addressed publicly within days by NASA Headquarters in Washington, where they could become part of the political debate on future NASA mission directions. The findings have already emerged within the scientific community in the form of an extremely detailed 46-page paper provided to Spaceflight Now on new Mars life findings. The document is part of the November issue of the respected journal Geochimica et Cosmochimica Acta, the journal of the Geochemical and Meteoritic Society. Its authors are Kathie Thomas-Keprta, Simon Clement, David McKay (who led the original team), Everett Gibson and Susan Wentworth, all of the Johnson Space Center. Keprta is the principal author. Although led by a Johnson Space Center team, the additional evidence for Martian life in the Allen Hills meteorite has been an open topic for the last several weeks in astrobiology division halls at the NASA Ames Research Center near San Francisco and at the Jet Propulsion Laboratory, Pasadena. It's hot news. The new work centers on so-called magnetic bacteria that on Earth, and apparently Mars as well, leave distinctively-shaped remnants in the rock. In addition the features test with a high chemical purity more like a biological feature than geological. These are just like the magnetite-related life forms found in the meteorite believed to represent Martian life forms, says Dr. Dennis Bazylinski, who peer reviewed the new findings. He also studies such Earth life forms in his laboratory at the University of Nevada at Las Vegas. "I think the paper is really excellent. I have no trouble with the paper," Bazylinski told Spaceflight Now. "I work on magnetic bacteria, and one indication there was life on ancient Mars are these particular magnetite crystals in the meteorite that look like they came out of magnetic bacteria. At first [when the data was reported in 1996], I thought there might have been an error. I have no doubt about that now. I know there is no error," Bazylinski stressed. "The big question is can these things [magnetite crystals] be reliable magneto fossils, and that is a matter of debate. "But it turns out that the magnetic bacteria make some very unique shapes of magnetite crystals. And one of the organisms we work with on Earth makes particles that look virtually identical to what we see from Mars in the meteorite." Another noted researcher in this field who has peer reviewed the new paper, and is supportive of the findings, is Dr. Joseph L. Kirschvink of CalTech. Unfortunately, as the new information was about to be announced by NASA, he was on a freighter hoping to survive a crossing the treacherous Drake Passage between Cape Horn and Antarctica, where he will do studies during the Antarctic summer. "One of the most interesting debates involving magneto fossils concerns their use by Dave McKay [and the Mars meteorite team] as biomarkers in the ALH84001 Martian meteorite. "This is clearly the most interesting and innovative use of potential magnetosomes as a biomarker," said Kirschvink. For years after the Martian meteorite data were first presented, opponents of the life theory argued that the same shaped features and associated chemical purity was just as likely caused by a thermal/shock event that blasted the material off Mars in the first place. 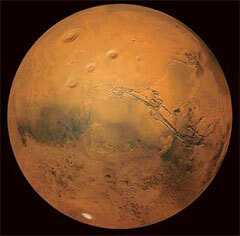 But research led by Kathie Thomas-Keprta of the original Allen Hills team has now proven the thermal theory is invalid, strengthening the team's argument that the "magnetic bacteria" features found in the meteorite were indeed formed by biologic activity on Mars and not some non-biologic thermal event. Although not a smoking gun, the new findings considerably strengthened the Mars life arguments that have been hotly and passionately debated for a decade, given that the discovery of life on Mars is the Holy Grail of science. That was made clear in the August 7, 1996, comments by President Clinton during the White House announcement of the initial findings, now considerably strengthened by Keprta and the rest of her team after years of hostile criticism. "It is well worth contemplating how we reached this moment of discovery," said President Clinton. 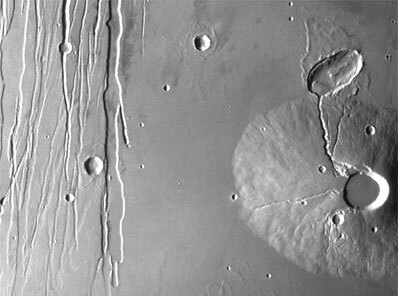 "More than 4 billion years ago this piece of rock was formed as a part of the original crust of Mars. After billions of years, it was blasted from the surface and began a 16 million year journey through space that would end here on Earth. "It arrived in a meteor shower 13,000 years ago. And in 1984, an American scientist on an annual U.S. government mission to search for meteors on Antarctica picked it up and took it to be studied. Appropriately, it was the first rock to be picked up that year -- rock number 84001," said Clinton. "Today, rock 84001 speaks to us across all those billions of years and millions of miles." "It speaks of the possibility of life. If this discovery is confirmed, it will surely be one of the most stunning insights into our universe that science has ever uncovered. Its implications are as far-reaching and awe-inspiring as can be imagined. Even as it promises answers to some of our oldest questions, it poses still others even more fundamental," Clinton said. "We will continue to listen closely to what it has to say," the president said. That is exactly what the NASA team has done over the last decade. And the message that is now coming clearer from Allen Hills ALH84001, 13 years after its initial analysis, is the more you dig into its past the more you will see that past included life on early Mars.